Happier times for the Marvel’s First Family. It’s here—after three years of waiting, filled with rumors as to the drama that potentially kept them away, today marks the release of Fantastic Four #1, and with it, the long-awaited return of Marvel’s First Family. Sort of. Kind of. There is a theme of coming home in this issue, but not quite in the way you’d perhaps hoped. Here’s the thing about Fantastic Four #1, by the new creative team of Dan Slott, Sara Pichelli, Elisabetta D’Amico, Marte Gracia, Simone Bianchi, Marco Russo, and Joe Caramagna: It’s a comic about returns. It is a comic about the return of the Fantastic Four as a team, especially. But it’s that and also a comic in which the Fantastic Four...don’t actually return. Literally no one is pleased about this. Not even the newscasters! If you were hoping to see Sue, Reed, Johnny, and Ben Grimm reunited as the Future Foundation looks on in tearful delight by the end of this debut issue, you’re probably going to be a little annoyed. Hell, Marvel’s even counting on that annoyance in a way—a cutesy one-page story by Slott, Skottie Young, and Jeremy Treece that ends the comic sees classic FF joke villain Mr. Impossible seethe that the team hasn’t actually reunited yet, only to be told by Marvel Editorial that it’ll be happening in Fantastic Four #2, presumably to cut off the inevitable wave of frustration. But despite all that, Fantastic Four #1 is a poignant examination of what it actually means to the Marvel Universe that the Fantastic Four is on its way home, and it uses that theme to examine the roots that these characters, and the characters around them, will return to. Naturally, Ben Grimm and Johnny Storm are the focal points of this study, as the two “surviving” members of the team still around, trying to carry on the legacy of their friends while having to privately and publicly come to terms with the fact that they might never see them again. Johnny and Ben have very different attitudes to the possibility of Reed and Sue’s return. After their adventures together across the multiverse in Two-In-One, Ben and Johnny have found themselves on opposite sides when it comes to the Four’s return, or rather accepting that it probably won’t happen. Ben is trying to go through the process of grieving that Reed and Sue will never come back, and trying to move on with his life in healthy ways—mainly by proposing to his long-term girlfriend, Alicia Masters. Unsurprisingly, while Johnny likes to play it cool publicly, internally he’s still very much unwilling to deal with the emotions surrounding losing his sister and brother-in-law. And, given that he is a literal hothead, they come to the fore repeatedly and in destructive ways in this issue—sparked by street punks stealing and setting off the classic FF flare launcher—threatening to drive a wedge between what’s left of the Fantastic Four on Earth. 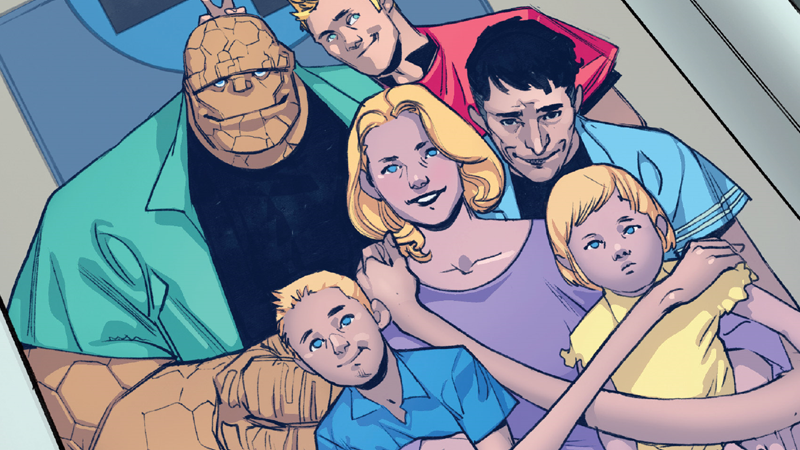 The false alarm doesn’t just serve as another flare-up of Ben and Johnny’s raw emotions over the team’s separation, but a reminder of just what the Fantastic Four still means to the Marvel universe—as it’s happening, there is a sense of public excitement, and eventually public disbelief, that the team was seemingly so close to being back. Newscasters long for the hope the Fantastic Four represented, the classic superheroic ideals they championed as Marvel’s first family. Beyond the personal turmoil of Ben and Johnny, their return is presented as something that the world is yearning for—a need for that hope again. So when, by the end of the issue—as Ben and Johnny are ready to throw down with each other in another argument about Reed and Sue—a real signal flare from Reed and Sue lights up in Earth’s orbit, it’s almost as vital a scene as the eventual, inevitable moment the team does reunite will actually end up being. Ben, Johnny, and Alicia get an actual sign that the Fantastic Four is on its way back. The optimism the Fantastic Four inspires within the grander realm of the Marvel universe is coming back. Now we’re just waiting for the rest of the team to show up to instill that feeling. But as ever with the Fantastic Four, these themes run parallel with the arc of their greatest foe, Doctor Doom, who has been on a fascinating journey in the comics for the past few years. From a savior figure role during Secret Wars to an attempt to turn hero in the absence of his most hated rivals, Doom has grown beyond the cackling villain he has long been to the FF. “Our Day of Doom and Victory,” a backup story that concludes the issue, twists the themes of return and hope found in the rest of Fantastic Four #1 into the markings of a more sinister return to Doom’s roots. A young Latverian named Zora inspires Doom to return as Latveria’s ruler. Playing on the turmoil Latveria has faced in the absence of its ruler, the story is brief but to the point—Doom is done being as a team player, the hero of the many, or seemingly even his prior goal as a ruler of worlds. In returning home and returning to his rightful rule, he is looking out for himself and his people and nothing more. To the people of Latveria, it’s the same sort of hope that is felt by the rest of the world for the Fantastic Four’s return, but for Doom, it’s a return to a darker path he’d seemingly cast aside these past few years.